If you have orders to Wright-Patterson Air Force Base, welcome! Whether you're assigned to the 88th Air Base Wing, Air Force Materiel Command (AFMC) headquarters itself, or one of the associate units, as As Air Force spouse Mary Eckberg says, "No matter where your orders direct, you’ll find yourself working amidst the best and brightest." But little did you realize that the benefits of your relocation to Dayton, Ohio extended beyond the job! The area gives you views of the most beautiful fall foliage you’ll ever see, access to great schools, and immerses you in a very active local community. There are a number of fantastic neighborhoods to live--Fairborn, Beavercreek, and Centerville are a few close to base. But my husband and I enjoy a little distance from base. 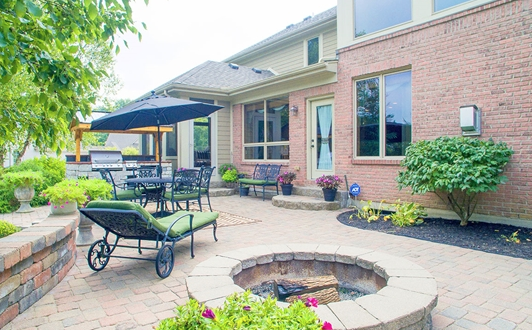 And if you do too, you’ll love this Bellbrook home just 30 minutes from Wright-Patterson. Bellbrook is located 30 minutes south of WPAFB. The Bellbrook area is a great option for you and your family for a couple of reasons--it provides the distance from base that you prefer while maintaining a comfortable commute, and it’s not too far from the festive events in downtown Dayton or shopping in Kettering. This six-bedroom, five-bathroom home in Bellbrook is a lot for its price. At 4,800 square feet, you and your family will have the space you need--not to mention, it’s gorgeous! 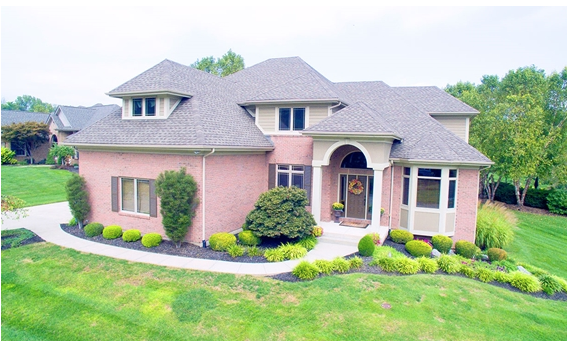 The home was custom built by Diorio and has everything you need and then some. It’s a two-story home with a finished basement. The main level features hardwood flooring, a formal dining room and living room, a study with french doors, and a kitchen you could only dream of. 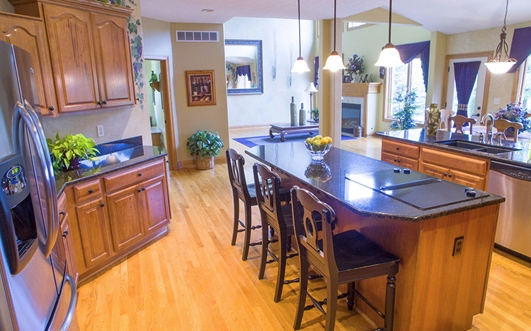 The kitchen features granite counter tops, stainless steel appliances, plenty of cabinet space, and a walk-in pantry. It opens up to the great room with a gas fireplace and a wall of windows, making casual entertaining a breeze. 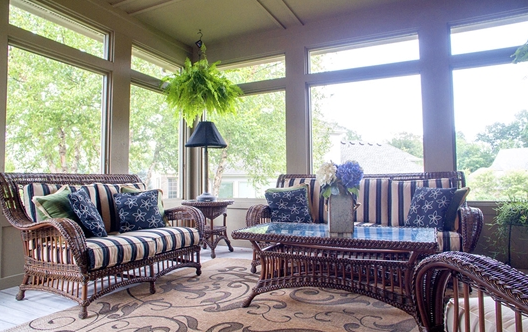 And you can enjoy your morning coffee in the cozy breakfast nook that opens up to the screened-in porch. 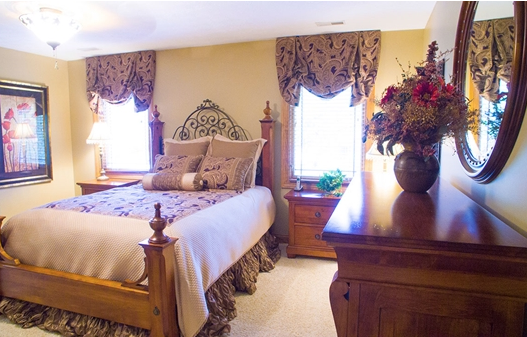 Upstairs, you’ll find the master suite with two walk-in closets and private bathroom. It features his and her sinks, a jetted tub, and separate shower. Also on the second floor are three additional bedrooms and two bathrooms. 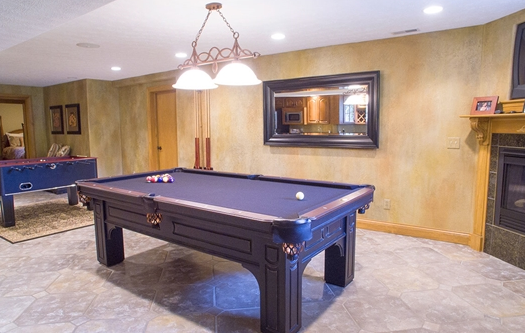 Lastly, the finished basement is the icing on this proverbial cake. The media room, recreation room, bar with granite counter tops and stainless steel appliances, tile flooring, two additional bedrooms, and the additional bathroom makes this space the perfect place for Sunday night football. Bonus: The outdoor living space on this property is everything you could ever want. Out back is an outdoor kitchen with a built-in grill and fridge as well as a cozy fire pit equipped with built-in seating. Your relocation to Wright-Patterson Air Force Base is one to look forward to. With the beautiful scenery, great community, excellent schools, and gorgeous homes, you’re sure to enjoy your time here. For more housing options near WPAFB, visit MilitaryByOwner's Bellbrook page!